If you are a beginner Ubuntu User then you should know that Ubuntu 10.10 Maverick Meerkat or any other version of Ubuntu uses GNOME as Default Desktop,but if you want to install KDE on Ubuntu 10.10,then it’s very simple because all the Linux based systems are perfectly modular.In general I like GNOME much as compare to other Desktops like KDE,LXDE,XFCE…. but it’s totally personal experience if you want KDE desktop in Ubuntu then just follow the simple steps given below.Many Ubuntu users agree on this point that KDE has better look as compare to other desktop.If you are a KDE Fan then there is one more point – A dedicated version of KDE+Ubuntu 10.10 = Kubuntu 10.10 is also available. 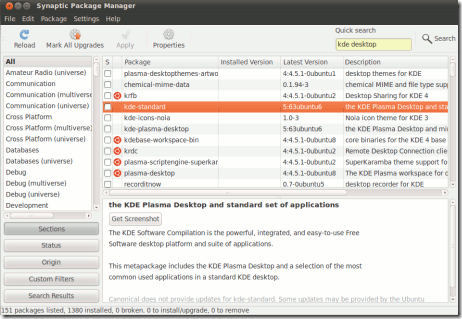 KDE can be installed in many ways but the best method is to install it from Synaptic package Manager.Before installing KDE you should select the package i.e Standard,Minimal or Full,because KDE desktop also contains KDE based applications.So choose the package you need.Then mark the left box in synaptic package manager and click on Apply to Begin installation.Depending on your internet bandwidth it wouldn’t take more than 15 minutes to finish the installation procedures.If you are still not sure about the above steps then go here step wise instruction for KDE installation. Logout from the current login session.At the login prompt choose your username,enter password and select Desktop as KDE at the bottom Right Menu.Then login as usual..Then you will be able to enjoy Ubuntu 10.10 with KDE. Thank you for letting me know of the Standard,Minimal or Full options that one has while installing one derivative of ubuntu beside another. By the way, is there any way I can display only those programs that have come with ubuntu when I am logged into the ubuntu session (likewise with kubuntu) instead of all programs showing up when logged on? Krishna, I think, this is not possible. The KDE menu (or Gome menu) will show all your apps, that are installed in your system. Thank you I have ubuntu ultimate edition 2.8 . I am going to try it on ultimate edition 2.8 since it was developed from ubuntu 10.10.